For the most part I try to keep on topic here about all things Italian especially from our Piemontese perspective here in the Alps, but before I jump into writing some posts this year about what we get up to in our slice of the Italian Alps, I thought I would share with you my latest grand adventure in food exploration. I occasionally digress and his is going to be one of those digressions. As a passionate and avid cook I have been on a food journey most of my life of some sort or another. Every step and stage of my life I have read, cooked, baked, canned and explored cuisines, techniques and pursued my all round unquenchable curiosity about our daily ritual of gathering, preparing and ultimately the enjoyment of feeding and dining with others. This current very popular food trend of lacto fermentation and culturing food and drinks in America has been a hot topic of conversation with friends and guests with various levels of interest. Some people are familiar and for others it is completely new to them. I imagine if you are reading this you most likely fall somewhere in between. 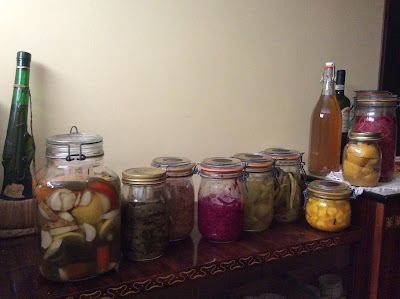 Fermenting and culturing is quite a broad subject that includes, pickles, cheeses, wild yeasted bread, also known as sourdough, and dairy products like yogurt and milk kefir, not to forget to mention wine, beer, mead, and kombucha and so much more. Another endless journey where it's all about the journey. 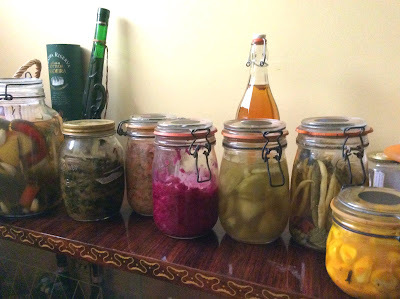 I am not an expert at all, but I have done a fair amount of reading and experimenting with this revival of this ancient art of preserving of food, so I thought I would share some of my enthusiasm for culturing, fermenting and especially lacto ferementation and other fascinating food and drinks. I will also share some of my sources of information and links to purchase some supplies and carry on your own research if you would like. You will find those links listed at the bottom of this post, so feel free to skip straight to them if you prefer. I grew up learning to preserve foods through salt and vinegar methods of jarring up pickles and veggies along with piquant sauces to enliven many a Mexican inspired dish or two after I moved out west. I really didn't know about fermenting foods with just salt and cool dark places. It seems that ancient tradition is long established in eastern Europe, Russia and Asia. I imagine if you came from immigrant families from those parts of the world these foods are more familiar to you. 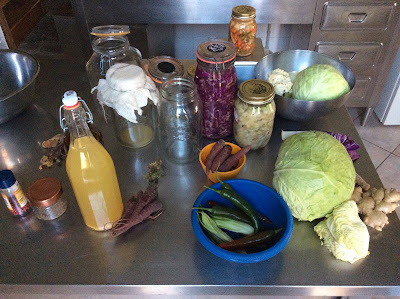 If you are unfamiliar with the term, lacto fermentation, it is about preserving foods, naturally, mainly with salt, and "it doesn't necessarily have anything to do with dairy. Instead, the lacto refers to lactic acid. All fruits and vegetables have beneficial bacteria such as Lactobacillus on the surface. In an anaerobic (oxygen-free) environment, these bacteria convert sugars into lactic acid, which inhibits harmful bacteria and acts as a preservative. It's also what gives fermented foods their characteristic sour flavor. "* I am providing links to some resources that I have found helpful and just to be clear, I have no affiliation with any of them nor receive any compensation, I just hope they will be useful for you also, or, at least give you a point to start your research. * quote from Emily Han September 2013 at "the Kitchen". 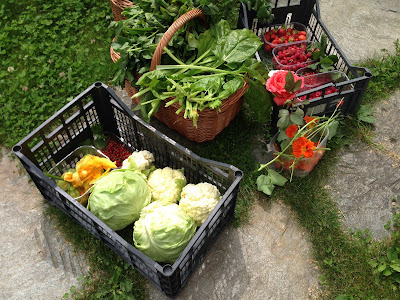 We have found it beneficial to be able to preserve an abundance of garden vegetables into tasty foods that will sit on the shelf until we can manage to consume them when the abundance has slowed down. It has the added benefit of adding much needed good bacteria to our often over taxed digestive systems from a variety of healthful foods, drinks and snacks. I would caution that there seem to be a lot of health claims being made for these sources of probiotics and for that I am always rather cautious with how much of it can be true. We do find that it has been helpful in aiding digestion and the kombucha and water kefir drinks give a refreshing lift. For me, if I feel indigestion coming on, a few tablespoons of sauerkraut or fermented root vegetable usually does the trick. I have also had success with my own apple cider vinegar and milk kefir too. For me they bring immediate relief and I find the milk kefir to be very comforting for the occasional bout of indigestion. Maybe its just me but you might at least give it a try. The various ferments add interest to salads, sandwiches, and side dishes, just like regular vinegar pickles do whilst adding more probiotic to your diet. Milk kefir has been a great way to make creamy salad dressings and dips as well as breakfast or afternoon pick me up smoothies. The journey to discover ways of enjoying all of these products is as interesting as making them. 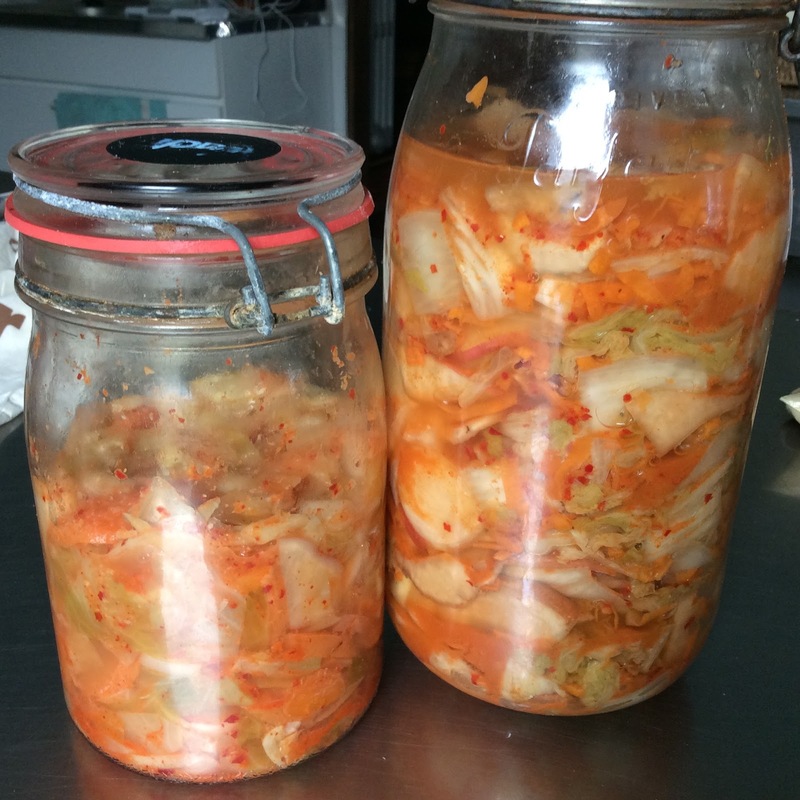 A few years back when I kept reading about lacto fermented foods everywhere I began my research in earnest, as it piqued my curiosity to learn more. Who knew what an all out frenzy of learning and experimenting that this way of preserving food was going to lead me down such a long and winding rabbit hole of discovery. It didn't take me long to drift over to a group on facebook called Wild Fermentation where the fun really took off. The group takes their name from the book by the same name, Wild Fermentation, written by Sandor Katz. 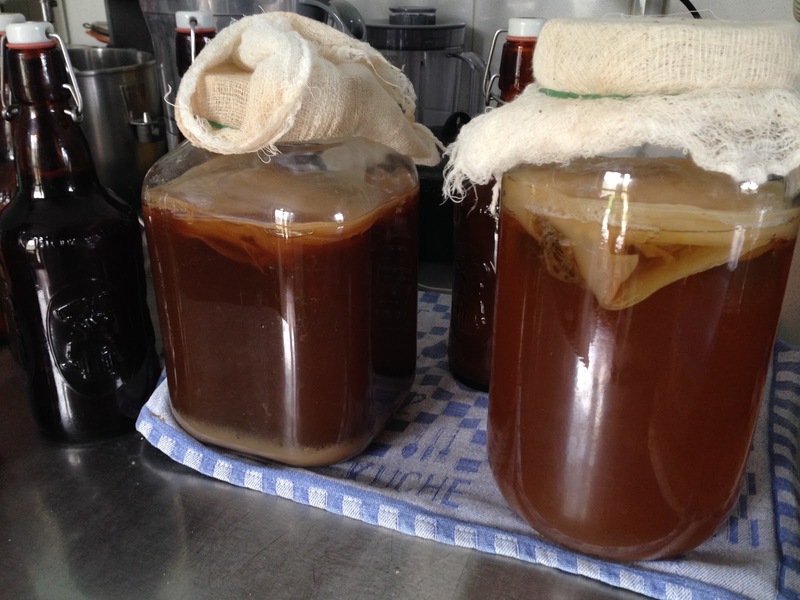 You don't get very far into your research about fermentation before Sandor Katz's name pops up frequently. 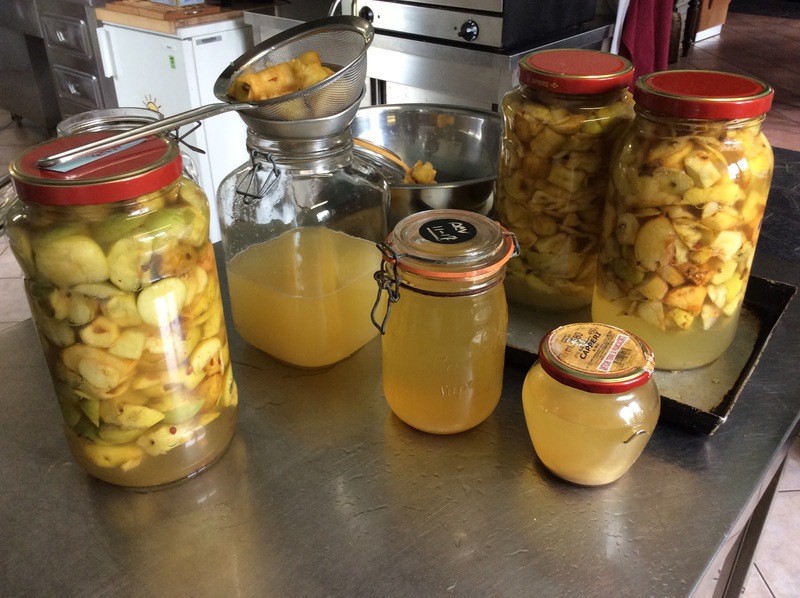 He refers to himself as a "fermentation revivalist" and it seems he certainly has had a pied piper effect in his sharing of fermenting knowledge. I promptly bought his book as an ebook and found it a great place to start and still reference it repeatedly. 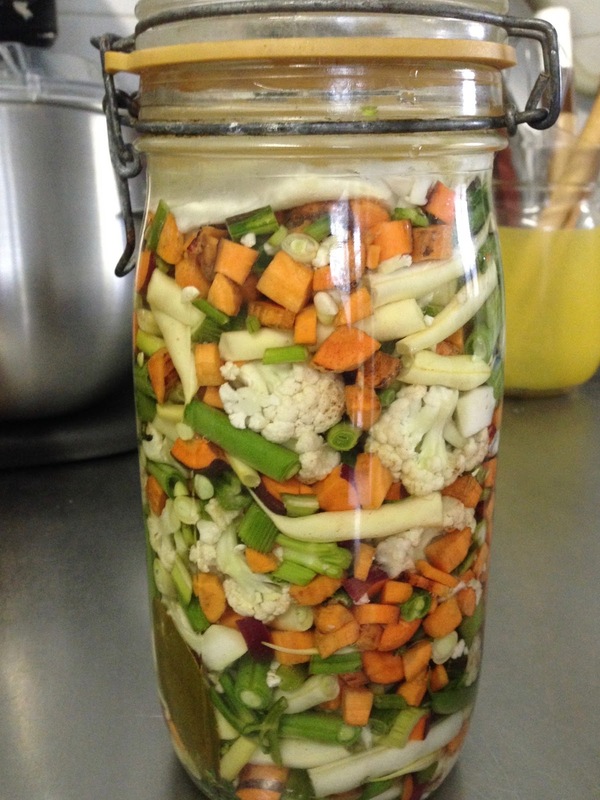 The folks on the Wild Fermentation facebook group are over the top crazy about preserving food in a tasty way. This effort to preserve has been happening ever since there has been an abundance of food that needs to be kept for the time when there is a lack of food. What a fascinating group of crazy fermenters. 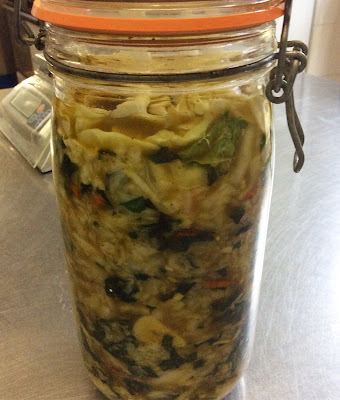 I had tried making a few jars of sauerkraut, which I hadn't made in years, but after discovering this group, I now have a whole new viewpoint for adding in other veggies, herbs and spices to add interest to the flavor profile. Who knew sauerkraut could be so interesting. The facebook group has files which are a great source of information and inspiration, as well as just scrolling through the groups feed and reading what others have asked and the groups answers. I have found the people there to be very helpful whenever I have asked any question. People are fermenting things I have never heard of and things I would have never dreamed of doing myself, like miso and tempeh, but now I think, perhaps one of these days, I just might give it a go. It's just all truly fascinating to me. Buying a book, Wild Fermentation by Sandor Katz is a great place to start. This link is to his site, there are others, but I haven't gotten that far as there is just so much out there to try once you get the hang of percentages. Sign up for Cultures for Health's newsletter and receive 8 free ebooks covering various types of fermenting and culturing that will answer a lot of questions and get you started with a source of recipes. You can unsubscribe at any time. They have a lot of sales and deals going all the time. The newsletters are very interesting and the website is a wealth of recipes, videos and selling point for products. My caution, I cut back on the frequency of their mailings and I am not completely convinced about the dried cultures. My preference is for live grains and starters. They are very knowledgeable and helpful. 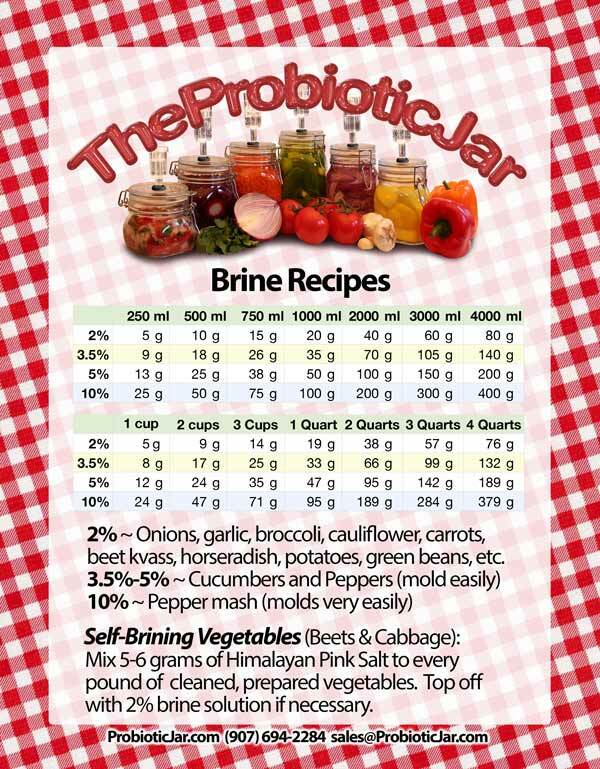 The folks over at, "The Probiotic Jar" have made a really handy brining chart that I have found invaluable for quick reference on amounts of liquid to salt percentage solutions. They have a great line of fermenting supplies and vast amounts of knowledge and experience. If you live on this side of the pond, I have found Happy Kombucha in the UK to be a great resource and where I sourced my Kombucha scoby and milk kefir grains a few years ago and they are still going strong. Try your hand at sauerkraut, as it is simple and an easy way to success. When making sauerkraut, use the direct salting and squeezing the cabbage to make its own brine. Don't use brine for kraut as it usually comes out too salty. Cut or slice your veggies into similar sizes and thicknesses so that they ferment at the same rate. Start with just 1 or 2 herbs or spices when you begin to add new flavors so you see how well you enjoy those flavors without muddying the results with too many different flavors going on. There is plenty of time later on to work up the complexities once you have a good idea of herbs and spices that work for your taste buds. I use a 2% salt brine or less for most brines. The more the salt the crisper the veggies, although the softer veggies have their place as well. Adding grape, oak, horseradish, or currant leaves to jars will help add tannins to keep the veggies crisp as well. I always add horseradish leaves to my dill pickles. Use the best water you can, chlorine will keep your veggies from fermenting and inhibit good bacterial growth. 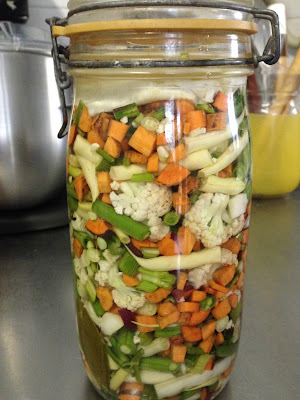 The less salt you use, the faster the veggies will ferment. A cool dark place is ideal for fermenting and storage. WArm kitichen counters will speed things up so you need to keep a watchful eye. Any type of pepper or pepper combo needs a 5% salt solution to preserve peppers and be safe. Start out tasting your ferments every day or so along the way to find what amount of sourness works for you. 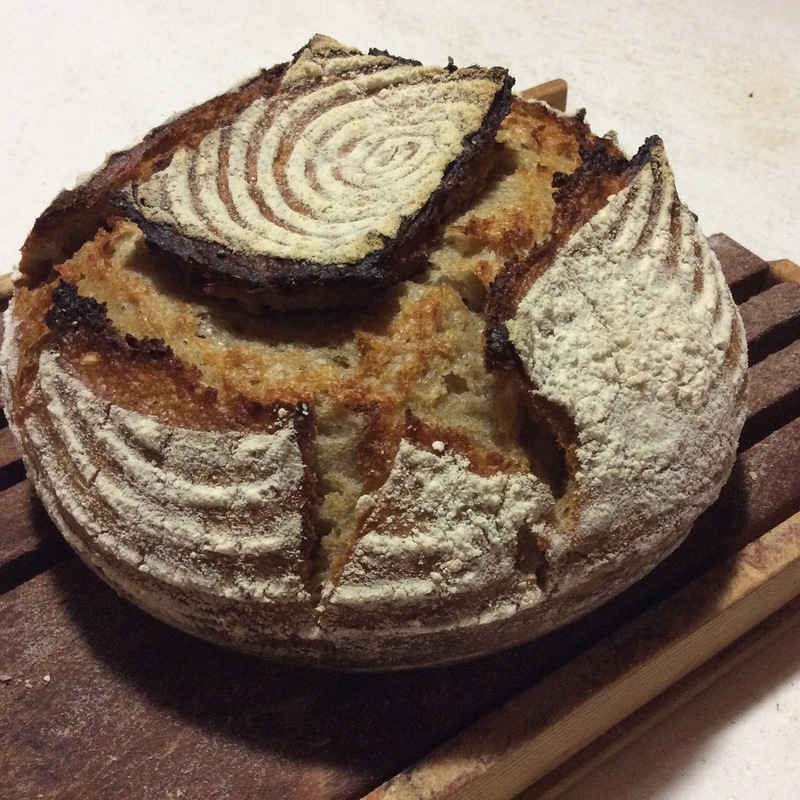 Don't give up too early as some times if you are not wild about the flavour, let it ferment longer and often it will vastly improve. I like my sauerkraut at least 2-4 weeks fermented. i had a beet and carrot combination that didn't excite my tastebuds till they had sat for 6 months. I had given up on it and was about to toss them. I was pleasantly surprised. On the other had I have found that some ferments are better with a shorter ferment for my taste buds. For instance, when I have added apple to sauerkraut I like a much shorter ferment and try to at it faster than a regular sauerkraut that can sit almost indefinitely as long as you keep it in a jar that doesn't have too much air space. So you may need to keep moving it into smaller jars if you are eating it fast enough. Here is "The Probiotic Jar's" Brining Chart for quick reference. I hope you have found this of interest and you will feel inspired to add another element to your cooking and daily diet. and a fresh start in 2018. Marla and Fabrizio at home with our cats Max and Misha and some of our cooking. Santa is in Pinerolo at the market. We've had a great season this year and I find that with all of our activities I just have a hard time keeping up on everything. I have however taking a lot of photos and have quite a few stories about what there is to see and do in our not well known but oh so deserving val Chisone. I plan to share stories and recipes in this coming year and will strive to get in a rhythm of posting more frequently as I love writing about our life and our neighborhood. Wishing you all the best now and in the coming year. I hope to get to know some of you and you will come back here and maybe even come and see us where we live. Tomini Cheese, in this part of Piemonte, Italy, means a soft fresh cheese that looks a lot like miniature ricotta cheese. Looking up Tomini in the large Piedmont chapter of our Slow Food book on Italian cheeses, Tomini is referred to as Tomini di Talucco, which happens to be the valley just on the other side of our on hillside, and it refers to it as pure goats cheese. It also states that the territory of origin comes from not only Talucco, but Grandubbione, which is where our road deadends 5 km further up the road from our house. It is the only Tomino listed in book which covers ever single region of Italy. So this type of cheese really is from our neighborhood. Here the Tomino is eaten in it's fresh state after a day of settling and letting the water drain out, it is salted top and bottom. 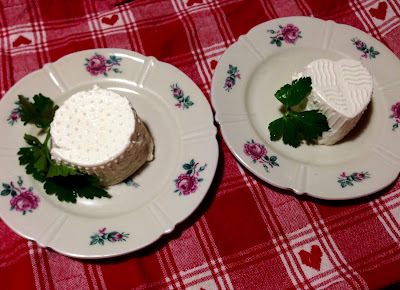 Tradition is also to mature the cheese after it has firmed up by dusting them with some black or red pepper, or domestic or wild thyme and then place it in a earthenware vessel called an "ule", or glass jars, till it is ripened to the cheese makers taste. My mother in law loves to ripen them till they are quite aromatic. So in our part of northern Italy Tomini was made completely with whole goat milk, although with changing times and palates you will find it also made with half goat and half cows milk or an all cows milk variety for those that like the style of cheese but not so fond of goat milk. I love goat cheese, so I'm a fan of the original, but not opposed to the other varieties. They are all delicious. There is also a variety of Tomini that is sometimes called dry Tomini that has been innoculate to form a white crust similar to brie cheese. Most cheese makers here call this type of cheese Pagliarine. It's a great cheese, but to me it tastes nothing like the Tomini type that is typical to here. 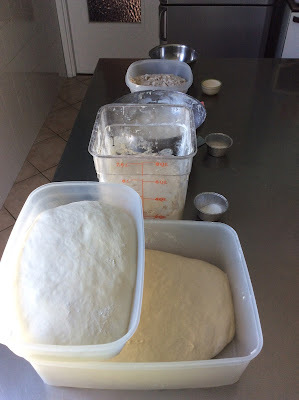 I've seen a variety of cheese makers work their their magic and thought why not give it a go at home since it seems relatively easy and I have access to fresh unpasteurized milk from what I like to call our mechanical cow over in Pinerolo. It's great because it still has the cream on top once it sits and it truly is delicious. It's our very own local milk without the milking. We have a lot of cheesemakers in our valleys and a long history of being famous for our cheeses. Its been said that General Hannibal, of the elephant fame, crossed the Alps around 3through our valleys because it was not only the quickest way to cross, but it was an opportunity to try and nourish his dwindling number of men on our Alpine dairy products, most notably cheese. A few years back we went to a Tomini cheese making demonstration in Talucco at Agriturismo Pinareul Arios, which just happens to be cousins in the extended way that people are related when your family has lived in the neighborhood for many generations. They still make their Tomini over a wood fired stove and it all done by hand within the family. They also operate a charming dining room that features their delicious genuine home grown and made food and is famous, not only for their Tomini, but for also their Fritto Misto alla Piemontese , an extravaganza of all sorts of savory and sweet fried foods. It's a popular indulgence in these parts and they do it well. 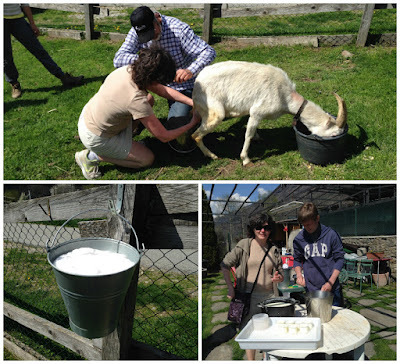 We also take guests up our Chisone valley to Vento Grigio Farm for a demonstration of milking and Tomino making complete with a light picnic lunch outdoors with a fabulous view of the Chisone valley and a change to have a go at milking a goat if you want to. Naturally we get to sample some of Cesare's pure goat cheese Tomino and you won't be disappointed. So now you can try and make some at home, as it isn't difficult, you just need some good quality whole milk, cows or goat, a large stainless steel cooking pot (needs to hold at least 5 quarts liquid), some rennet for producing the curds, something to hold the curds and shape the cheese while allowing the water or whey to drain out. 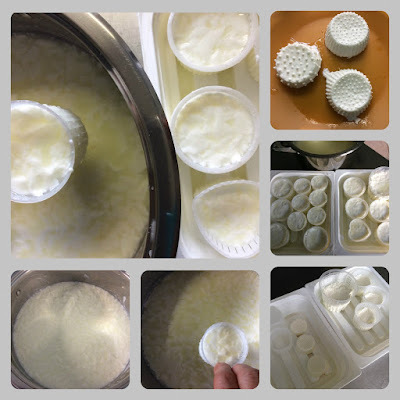 There are proper forms that you can find from cheese making suppliers or some cheese cloth lining a strainer or colander that you could use while you decide if this is something you might make more than once in a blue moon. If the milk has been refrigerated, let the milk set out to bring it to room temperature before heating. Place ambient temperature milk (37*C / 98.6*F) in the large pot. Slowly raise the temperature of the milk to at least 75*C (167*F) that will pasteurize the milk. According to some cheese makers, bringing the milk to 75*C-85*C (167*F-186*F) pasteurizes the milk but leaves some good bacteria that adds flavor and nutrition. If you heat the milk all the way to 90*C (194*F) it sterilizes the milk. Once the milk reaches the desired temperature hold the milk there for at least 5 minutes. My pots hold the heat quite well, so I turned the heat off and kept the thermometer in the milk to make sure the heat didn't dip below the 75* mark until after the 5 minutes. Descriptions of making Tomini states the milk needs to go to 85*C, but cheese makers seem to have varying opinions on this point. It seems to be their twist on making the Tomino recipe their own. Allow the milk to cool down in the cooking pot to 38* (194*F). The temperature can drop quickly so keep a close eye on the temperature of the milk. Add the caglio (rennet) and stir throughly to distribute the rennet. Cover the pot with a lid and allow to cool undisturbed for at least 40 minutes - 2 hours. You can raise the lid to peak in just don't stir or move the pot gently if needed so as not to disturb the milk curds. I did the 40 minutes one time and it didn't seem to be enough time for mine to set properly, so now I just go with the 2 hour timing. Once you let it cool down you will find that the milk has softly solidified and pulled away from the sides of the pan. There will be a clearish whey formed between the cheese and the pot. Take a long handled spoon or metal spatula and start by making a long cut through the top to the bottom of the curd and draw a line horizontally toward you. Lift the spatula out make the same motion horizontally across the curd to form the blessing of the cross. Then gently cut the curds up the same way throughout the whole of the pan until the curds form and the whey begins to be throughout the whole pot. Let the curd set for a few minties and then either scoop up the curds with your form or fill the forms gently lifting the curds and pouring then into the draining forms. Fill a few forms and keep going back to refill, as the curds will give a lot of whey even after sitting. **Do not let the cheeses sit in the drained whey because it is bitter from the rennet and will give an off flavor to the cheese. There are draining trays here for helping with that problem, but even with those you must keep watching them for a few hours as they will give off whey for a couple of days. After the first few hours the amount will slow down, but be very vigilant with making sure the cheese does not rest for very long in the whey. 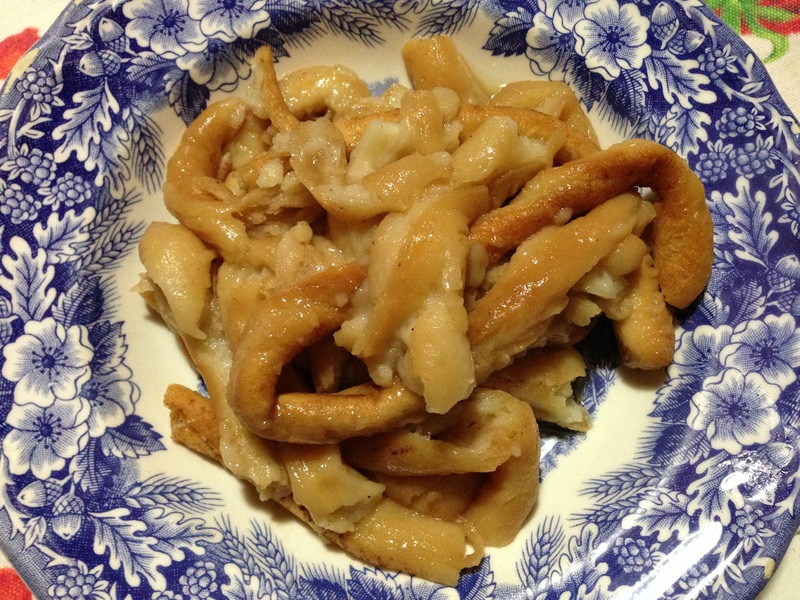 They can be eaten after a couple of hours, but will be quite soft. I would let the others sit at least over night if you can before unmolding them to stand on their own. If desired, you can sprinkle a bit of salt on the top and bottom of the individual cheeses, but not everyone does that. Many people here prefer them with out the salt to taste the freshness os the milk. its a bit like unsalted and salted butter. They both have their place. You can always salt them to taste when eating. The cheeses will last several days to a week ot so depending on your salting or not and how you hold them. I keep the nin the refrigerator unless I am going to salt them and dry them with a bit of pepper or herbs. After a day or two of air drying you can then put them in the jars or earthenware jar. They will get strong tasting after a week or so and you can ripen them to taste. Usually for us, they never get that far, as we will have eaten them with tomatoes, and a drizzle of good olive oil or hot pepper oil, a few cranks of fresh cracked pepper for a delicate fresh cheese that you made yourself. *The whey is good as an addition to bread and some types of baked goods. It has also been used in making home made soap. You will find that many animals will enjoy the rennet also, but not all. It's still chilly these days even though February this year was milder than usual and bowls of hearty vegetables and pasta still go a long way to taking the edge of that chill off. 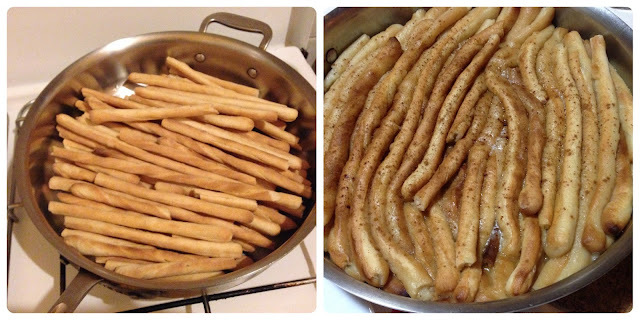 This particular recipe I started making this summer after one of our volunteers, Mascia, prepared us one of her favorite dishes, her grandmother's recipe for pasta e patata, or pasta and potatoes. It's always a treat when someone cooks for us, and especially so when its from one of our volunteers. We've had a variety of International cuisines over the years, Japanese, French, Dutch, Italian vegan / macrobiotic and even my familiar American. Most everyone can always use another pasta dish to add to their repertoire.This one seems to be a classic dish in many parts of Italy with as many variations as their are cooks I would imagine. 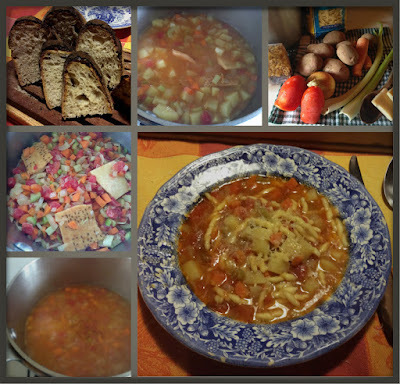 In it's simplest form it is very much like what many of us think of as minestrone soup without the beans. Some people like to add a bit of saltiness and flavor punch by adding in some form of porky cut of meat with various levels of fattiness and smokiness or not. Some like a bit of red pepper zippiness or a touch of oregano. Most are a thick "stick to your ribs" kind of consistency. The Neapolitan version is finished off in an oven proof dish smothered in smoked, or not, provolone cheese slices and heated till the cheese melts and served right away. This version is a simpler straight forward version that Mascia insisted that the butter used to sauté the vegetables was her nonna's secret ingredient. Here in the north they are fond of using butter and it does make a tasty addition to this simple dish and is highly recommended. What ever your preference might be I think you will find this classic pasta dish a great comfort and "go to" recipe for any day of the week. Thanks Mascia for sharing your nonna's recipe. *Variation: In Naples and other southern parts of Italy they will put the finished dish in oven proof bowls and cover the top with some slices of smoked provolone cheese. Heating it to melt the cheese before serving. In a medium pot, at least 2 qt/L, heat your pan, then add the butter and olive oil. Once the butter has melted and the oil is heated, add the diced onion, carrot and celery. Sauté the vegetables on a medium heat for a few minutes. Cook until the vegetables are soft, but hasn't picked up any color, about 3-5 minutes. Then add the meat if using, and tomatoes, cook a few more minutes. and the potatoes and pasta. Taste and adjust seasonings keeping in mind that the crusts will add salt to the dish. Add the Parmigiana crusts if you have them. Cook until the potatoes and pasta are cooked, adding the other ½ -1 cup of additional water to reach a creamy texture, but not too soupy. Serve hot and garnish with Parmigiana if desired.